明天去墾丁！Tomorrow I’m going to Kenting! Je vais à Kenting demain ! I’m flying to Kaohsiung, Taiwan, and heading to Kenting tomorrow, ahead of Spring Scream and other activities in this national park and resort town at the southernmost tip. This will be the second time there and I already feel very anxious at the prospect of adventure! 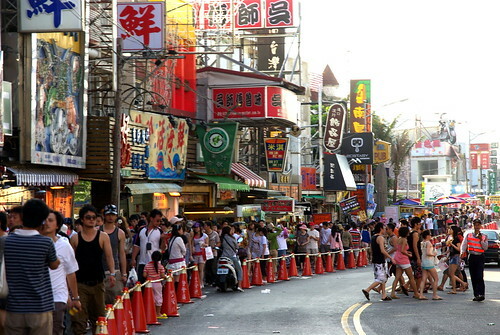 Every year, thousands of mostly young Taiwanese descend on the provincial town to party. But this is a special year as the Chinese holiday of Ching Ming (public holiday in HK, Taiwan) coincides with Easter, resulting in a 5-day long weekend instead of the usual 3-day one. Spring Scream is my main attraction to Kenting, but other festivals have taken greater space in the festivals/parties landscape in recent years. Spring Wave is perhaps the most serious “competitor” despite the fact that they are very different events. Spring Wave is a single big main stage populated with very big names of Mandarin music, of all-Chinese (including the Mainland) household names like Sodagreen, Mayday, Tanya Chua and Cheer Chen. Spring Scream usually has well-known names on the front stage, like Deserts Chang and Faith Yang in 2008, but they are mostly a chance for smaller amateur acts to get stage experience in SS’ other 7-8 stages. On another note, I won’t be doing any live coverage like I did for Bande a part in 2008, but will be blogging like I can… on my cellphone this time (like now). Please take the chance to subscribe to my twitter at commeleschinois.